Tor M1 / SA-15B Gauntlet system (Kupol JSC). 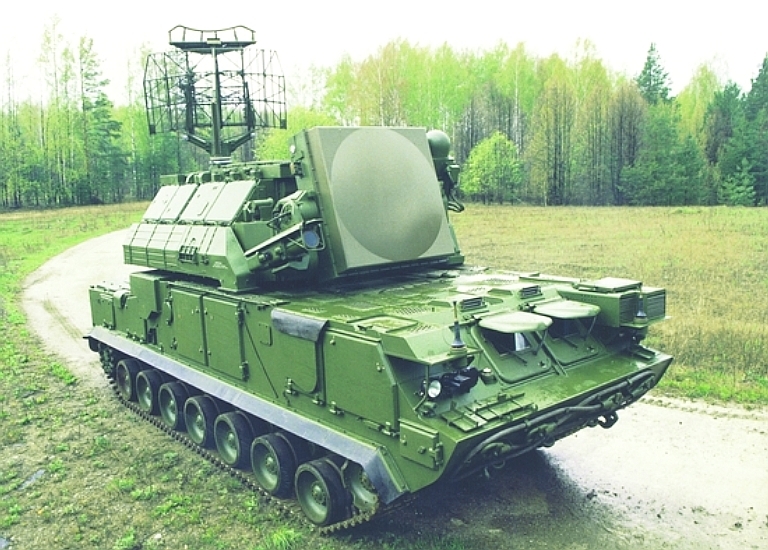 The 9K330 Tor/Tor M/Tor M1 family of SAM systems have been integrated on and supplied on the Metrovagonmash GM series chassis, also used for the SA-11 and SA-19 systems. Микропроцессорная система диагностики и автоматического переключения передач. 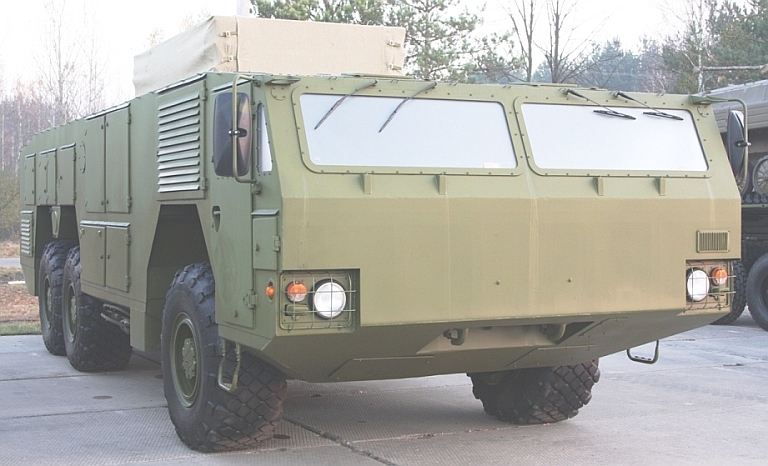 Preproduction MZKT-6922 TEL/TELAR vehicle with two piece windscreen and short nose (Image © Miroslav Gyűrösi). The MZKT (Minskiy Zavod Kolyosnikh Tyagachev / Minsk Wheeled Tractor Factory - formerly MAZ) MZKT-6922 family of hardened vehicles were specifically designed as platforms for air defence equipment, and are on offer for a range of air defence weapon systems. The design is unusual in the sense that it can accommodate both point defence weapons and area defence weapons. 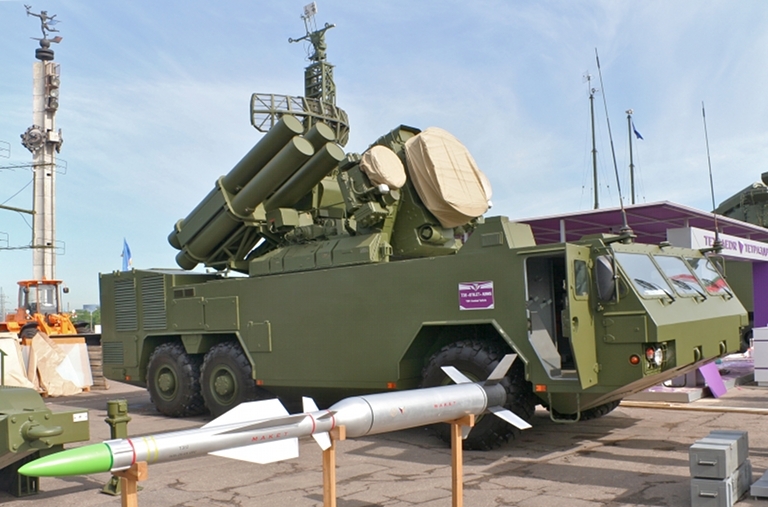 There are at least two known variants of this design, the baseline MZKT-6922 offered for the Almaz-Antey/Kupol 9K331MK2/MU2 Tor M2/M2E / SA-15 Gauntlet, the 9K37M1 Buk M1 / SA-11 Gadfly, 9K317 Buk M2 / SA-17 Grizzly and the slightly different MZKT-69222 being supplied by Tetraedr as a replacement chassis for 9K33 Osa 1T / SA-8 Gecko upgrades and the new T38 Stilet SAM system, supplanting the legacy BAZ-5937 6x6 TELAR. Early prototype MZKT-6922 vehicles employed a two piece windscreen, which has been supplanted in later prototype vehicles by a three piece windscreen, and resculpted front section. All but one variant appear to share the use of hydraulically deployed outriggers with circular pads, the front pair mounted just aft of the front wheels, and the aft pair just behind the rear wheels. 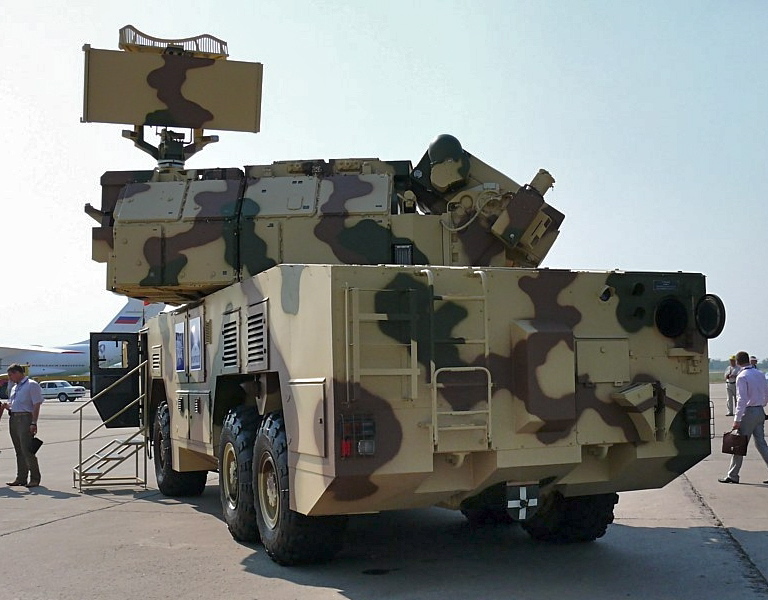 The variants in development for mast mounted and acquisition radars employ additional horizontal booms to deploy the outriggers outboard of the vehicle sides, the intent being to increase the moment arm and thus improve tolerance to wind forces. 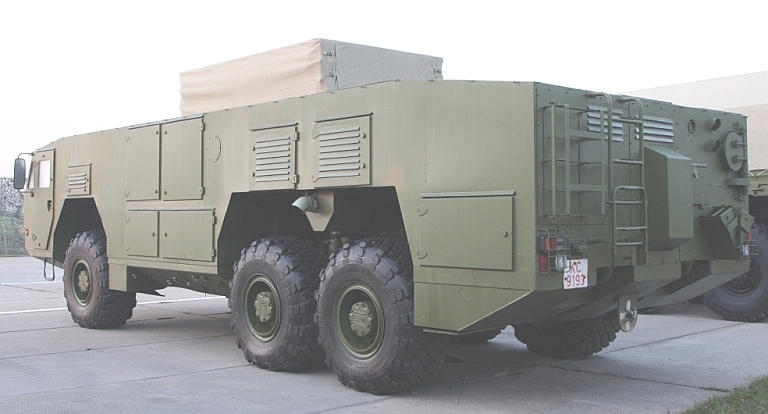 It is likely the MZKT-6922 employs a hydropneumatic suspension with variable ground clearance settings, as at least one image exists showing the vehicle hull lowered by at least 12 inches relative to typical ground clearance. MZKT have extensive experience with central tyre inflation systems on the MAZ-535/537/543/7910 series of all terrain vehicles and a CTIS is likely installed on the MZKT-6922 series. 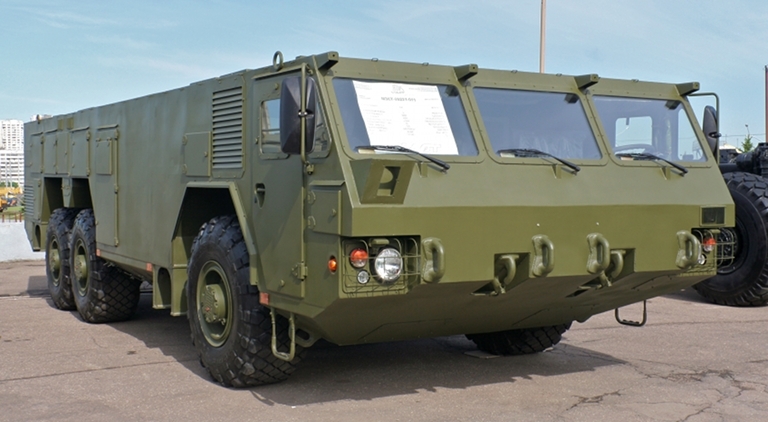 The Tetraedr MZKT-69222 variant uses a diesel generator APU rather than gas turbine generator APU to power the weapon system, different driver instruments, and a pair of dorsal air conditioner boxes over the driver cabin. This variant is easily distinguished by the raised rear section over the rear right hand side APU, and the absence of the large circular gas turbine APU exhaust port and door, characteristic of the Tor M2E and Buk M1/M2 subtype, and the use of the dorsal air conditioner covers. T38 Stilet prototypes lack the four hydraulic outriggers. A variant with a raised forward cabin and full height entry doors is evidently in development, as a vehicle for the 9S470 self propelled command post and 9S18M1 Snow Drift self propelled acquisition radar. 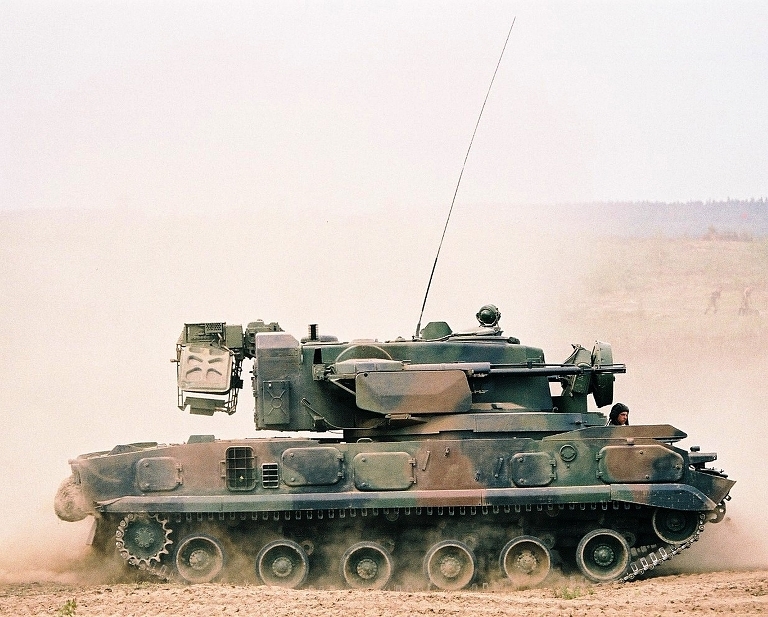 It would also be a candidate for a compatible chassis replacement for the 9S737/MP-22 UBKP Ranzhir E/M and PU-12-M6/M7 Battery Command Posts. At the time of writing detailed technical specifications and drawings for this vehicle remain scarce. The powerplant is a YaMZ-7513.10-02 or -04 turbocharged 8-cylinder diesel rated at 309 kW (420 SHP). An option is the Volvo D246.30E3-300 Diesel engine. The gas turbine and diesel APU types have not been as yet disclosed. These are intended to significantly reduce both fuel burn and vehicle infrared signature while the SAM system is waiting for a target and thus not moving, while reducing wear on the main engine. The vehicle is hardened against small arms, spall and shrapnel - a pragmatic need given the prospect of near misses by anti-radiation missiles and other guided munitions. Miroslav Gyűrösi, Tetraedr trials a new Osa-1T chassis, Janes Missiles and Rockets, September, 2009. Miroslav Gyűrösi, Źwiatowa premiera Tetraedra (Tetraedr World Premiere), Obrona Przeciwlotnicza, Nowaja Technika Wojskowa, March, 2011. Early production MZKT-69221-011 TELAR chassis at Milex 2011. 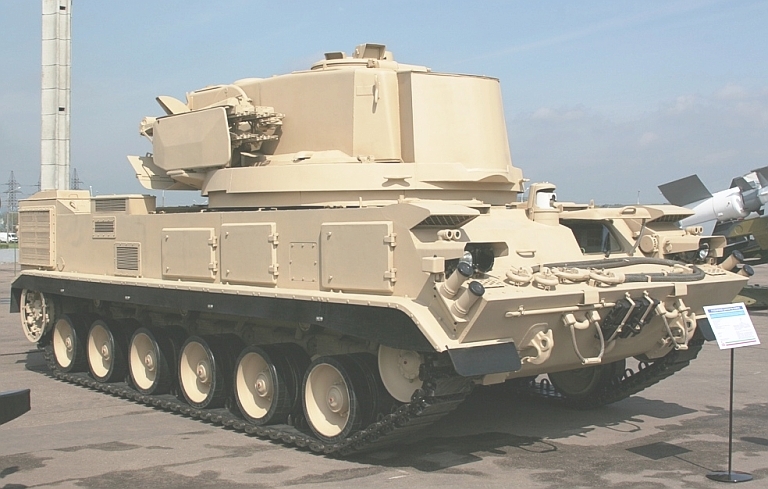 This variant has a gas turbine APU and a flat dorsal area to accommodate large turrets, such as used with the SA-15 Gauntlet and SA-17 Grizzly (© 2011 Michael Jerdev). 9K317E Buk M2E / MZKT-6922 battery component models at Zhuhai 2010 (© 2010 Air Power Australia via Zhenguan Studio). 9K317E Buk M2E / MZKT-6922 TELAR and Transloader/Launcher prototypes at the armoured vehicle proving ground open day in May, 2010 (© 2009 igor). 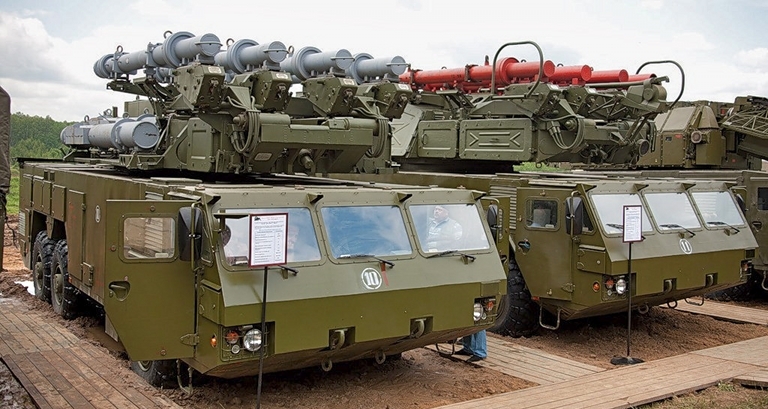 Above, below: 9K317E Buk M2E / MZKT-6922 TELAR and Transloader/Launcher prototypes, and a 9K332 Tor M2E / MZKT-6922 prototype. Note the closed circular gas turbine APU exhaust port on the rear right hand side (© 2009 igor). 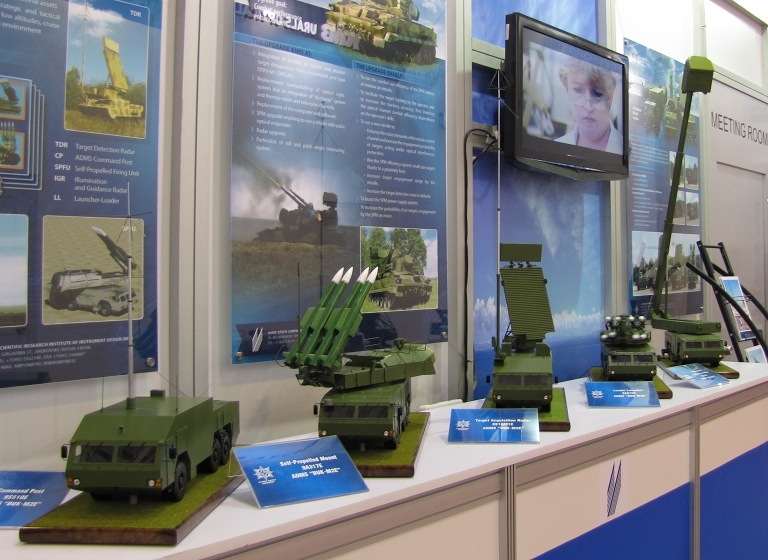 Tor M2E on early prototype MZKT-6922 at MAKS 2007 (© 2007, Said Aminov, Vestnik PVO). Aft view of Tor M2E / MZKT-6922. Note the open gas turbine APU exhaust (© 2007, Said Aminov, Vestnik PVO). Tetraedr 9K33-1T Osa 1T / SA-8 Gecko on MZKT-69222 at MILEX 2009 (Tetraedr image). Tetraedr T38 “Stiletto” / SA-8 Gecko on MZKT-69222 at Milex 2011 (© 2011 Michael Jerdev). 96K6 systems at the KBP plant prior to delivery to the Russian government client (Sergei Kuznetsov via Strizhi.ru). 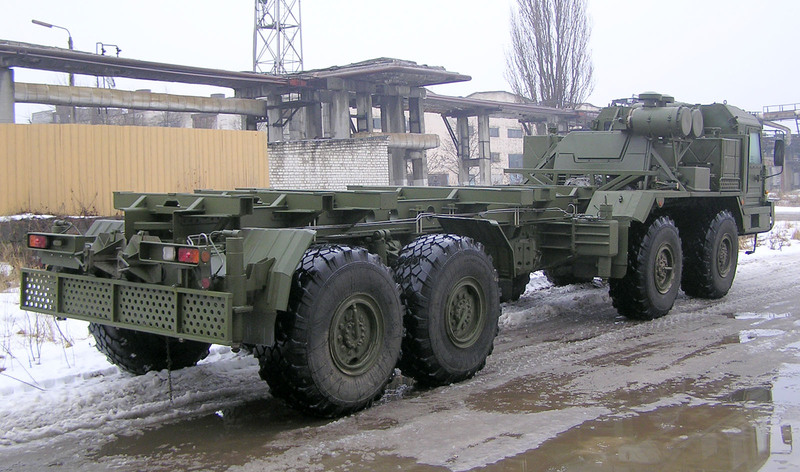 The Pantsir S1/S1E system is highly modular and designed for installation on a range of truck chassis. 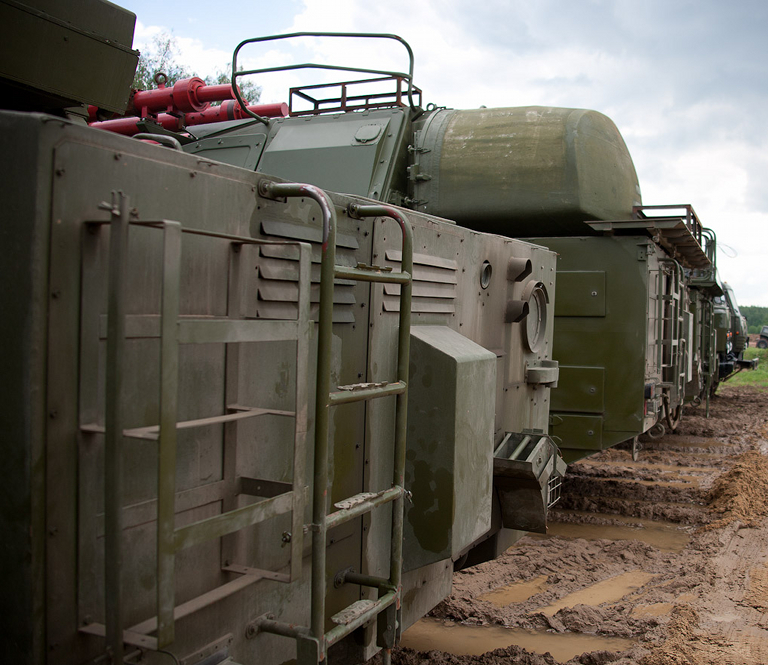 Production Pantsir S1 and S1E systems have been supplied on the 8x8 KAMAZ-6560, the 8x8 MAN Cat SX A1, while the prototype was also hosted on the 8x8 MZKT-7930. 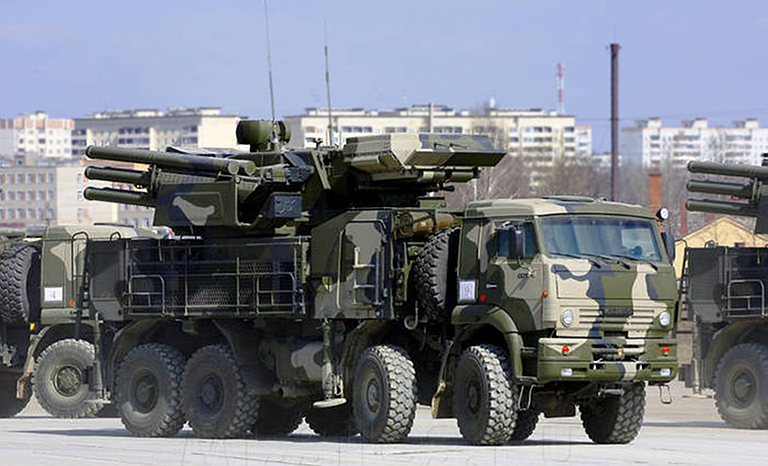 The most recent vehicle observed hosting a Pantsir S1 is the 8x8 BZKT BAZ-6909 heavy truck. A configuration of the Pantsir S and S1 which remains on offer uses the 8x8 MZKT-7930 chassis, providing much better cross country mobility than the lighter KAMAZ chassis, at a cost (KBP). The Pantsir S1/S1E is currently being supplied to the Russian MoD and export customers on a four-axle KAMAZ-6560 heavy truck. 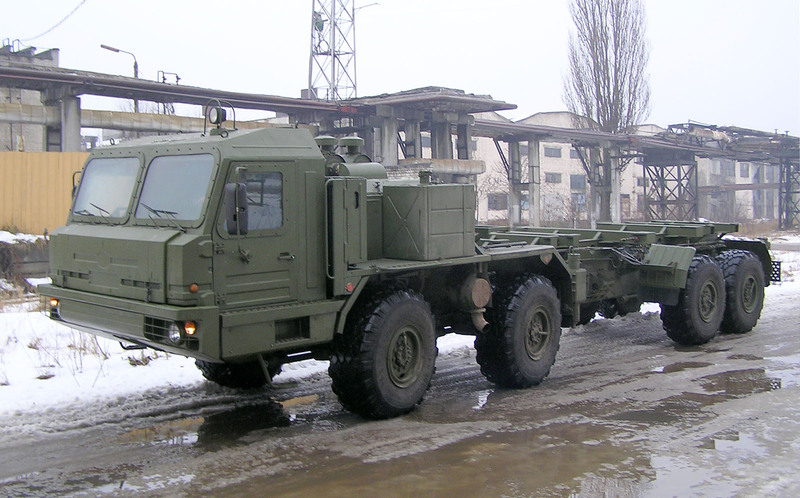 The KAMAZ-6560 is based on a family of KAMAZ military trucks, intended for use as artillery tow tractors, or heavy general purpose trucks. This chassis has a maximum gross weight of 38 tonnes, it can carry loads of up to 23 tonnes. 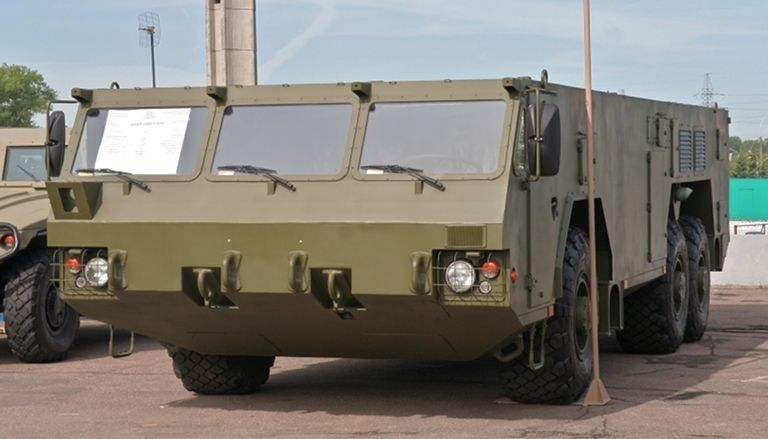 The vehicle is equipped with a 400 SHP KAMAZ-740.35-400 engine. Maximum road speed for this 38 tonne gross weight system is 70 km/h. 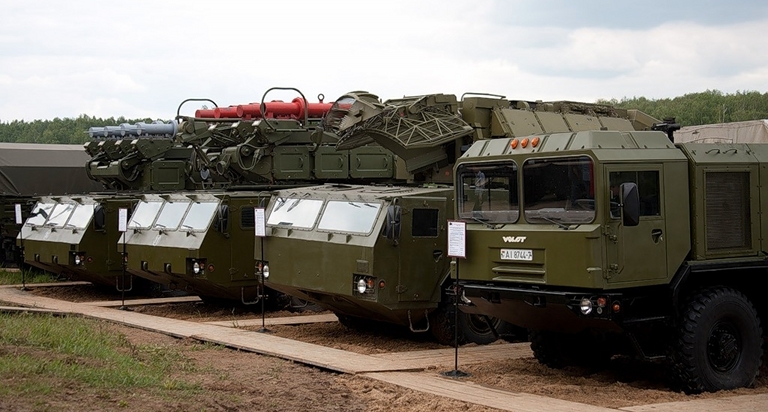 Fully deployed 72V6 SPAAGM on BAZ-6909-019 chassis (Sergei Kuznetsov via Strizhi.ru). 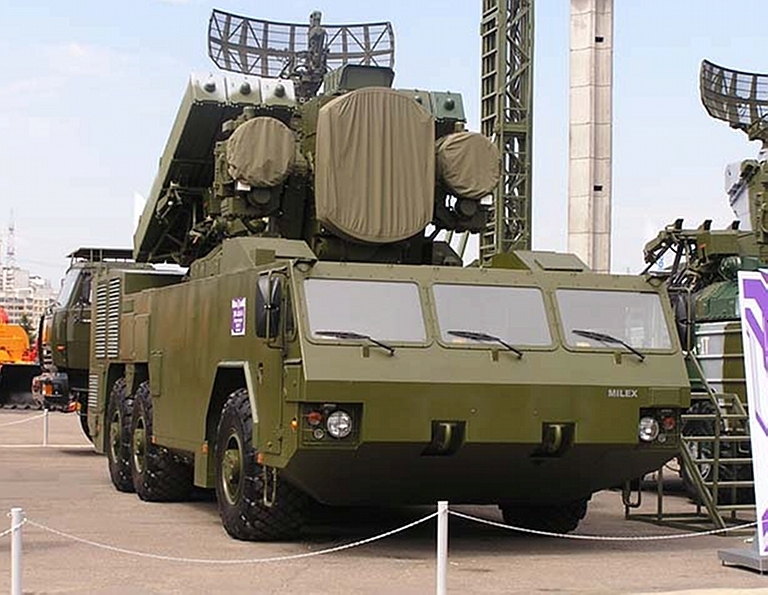 At least one prototype Pantsir S1 system has been recently built on the BAZ 6909-019 “Voshchina” series 8 x 8 chassis, common to the S-300PMU2 / S-400 / S-500 SAM systems, NNIIRT 55Zh6M Nebo M radar system, and initially developed as a heavy artillery tractor for offroad use. These vehicles were developed as tow tractors for heavy artillery pieces and heavy high mobility general purpose trucks. The BAZ-6909 is part of the extensive BAZ-69092 “Voshchina 1” series of military trucks built by the Bryanskiy Avtomobilnyy Zavod (Брянский автомобильный завод). This 41,300 kg gross weight class vehicle is powered by a YaMZ-8431.10-200 or YaMZ-8942.10-033 turbocharged diesel, rated at 347.8 kW/475 SHP. It can climb obstacles of up to 1.4 metres in height, and the 550/75R21 tyres are connected to a central air pressure control system, similar to many armoured vehicles, to maintain inflation when perforated, and control traction in very soft terrain. To date all operational systems with Russian military units have been observed on the KAMAZ-6560. 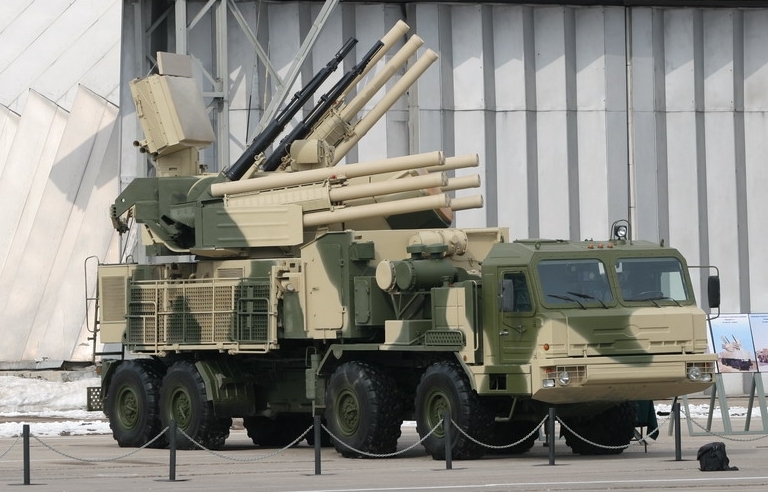 The larger BAZ-6909-019 would offer better cross country performance and potentially more reload rounds in storage than existing 96K6 Pantsir S1 TELARs. 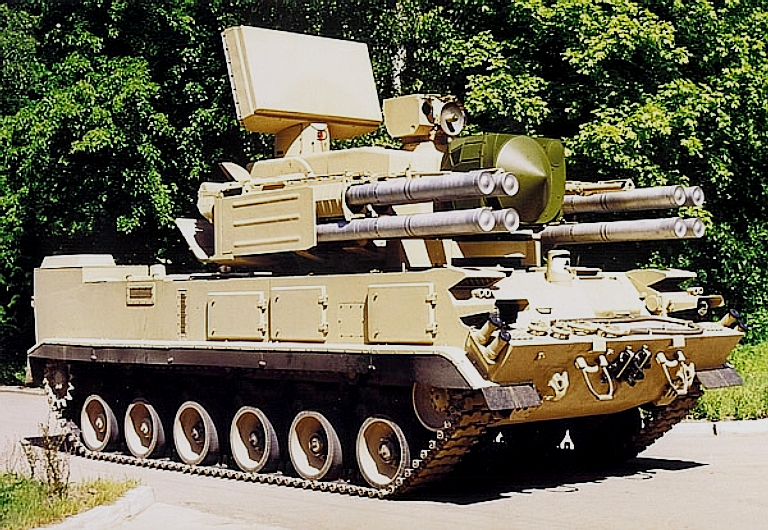 Stowed 72V6 SPAAGM on BAZ-6909-019 chassis (KBP via Missiles.ru). 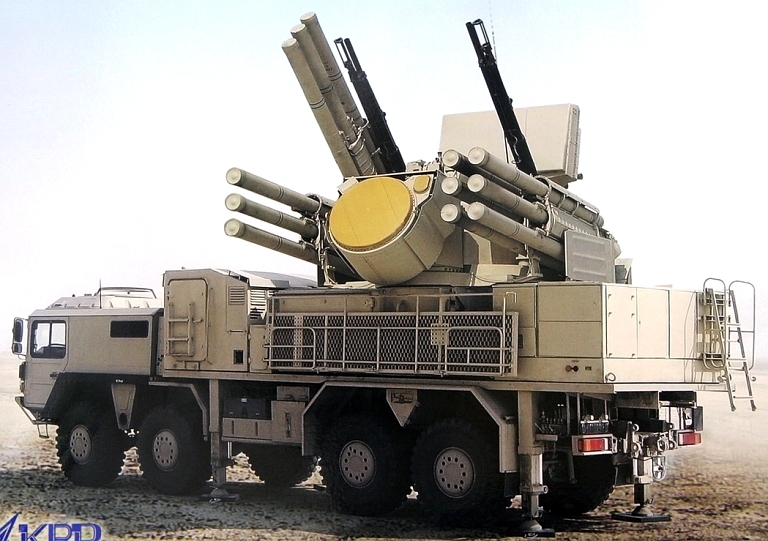 Pantsir S1E exported to the UAE on a MAN Cat SX A1 8x8 chassis (KBP via Miroslav Gyűrösi). 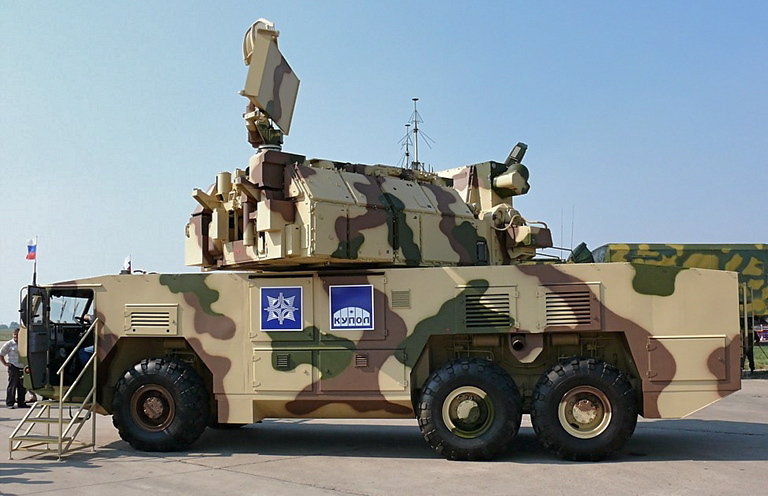 Export Pantsir S1E systems supplied to the UAE were installed on the EU built MAN Cat SX 45 8x8 chassis. This chassis is similar in performance to the Russian equivalents. 2S6M Tunguska M at the Berezina 2002 exercise. This is the “classic” Metrovagonmash GM5975 series tracked chassis, used for a range of applications (© Miroslav Gyűrösi). 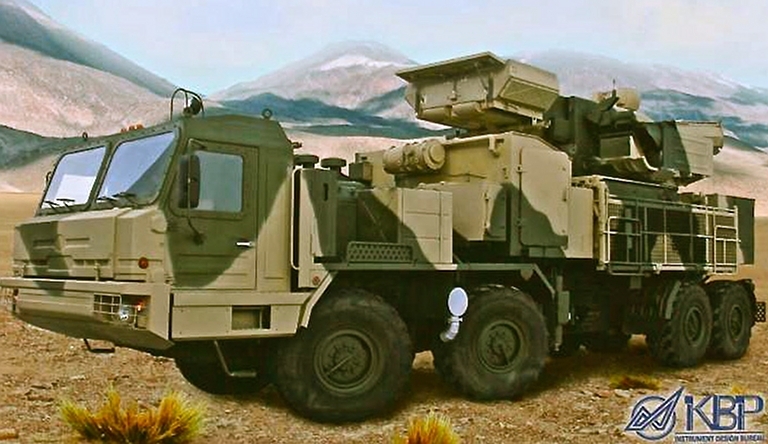 The 9K330 Tunguska M/M1 / 96K6 Pantsir S1 family of SPAAGM systems have been integrated on and supplied on the Metrovagonmash GM series chassis, also used for the SA-11 and SA-15 SAM systems. 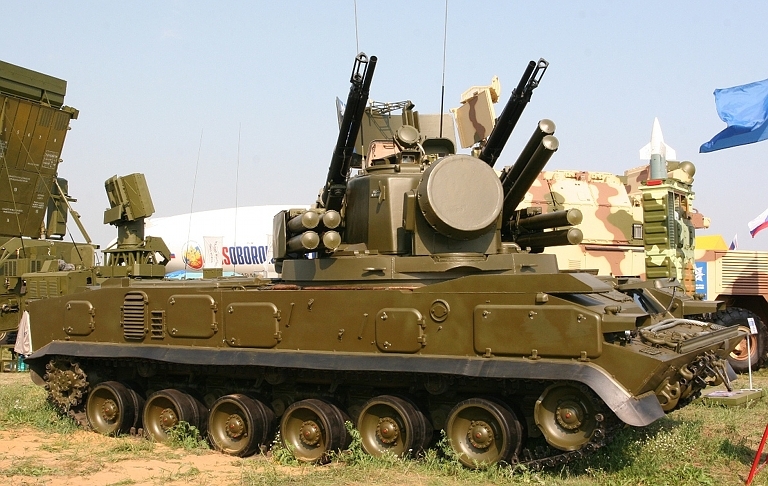 New build GM352M1E chassis with a new turret installed, intended to fit the SA-22 weapon system. The turret shape is similar to both the 2S6M1 design, but modified in several respects to accommodate the heavier and longer 5E96 series missile launchers, and the very much larger and heavier 1RS2-E Roman and 2RL80E radar systems (Image © Miroslav Gyűrösi).